There was the hint of spring in the air while walking around the college campus one Wednesday. The warmer weather, and bright sun, was the reason my head was up instead of bowed against the cold and wind. If it had not been for the warmth I might never have noticed that every other person appeared to have a black smudge on their foreheads. Even some professors had the smudge! Well, it was a Catholic college, it must be one of those things Catholics did? Then I heard talk of giving up Facebook, chocolate, and video games for Lent. Lent, I vaguely knew what that was. Yep. It was definitely a Catholic thing. Wait! I did a double take. Was that my Lutheran friend with a black smudge? So maybe not just a Catholic thing? Although...they are both liturgical churches; maybe it is a liturgical church thing? It was a few more years before I understood that those "liturgical church things" are a way of growing and deepening my relationship with Christ. The black smudge, as later learned, did not start as a smudge. It was given by a priest to those who attended Mass that morning. The priest dipped his thumb in ash and drew the sign of the cross on each person's forehead, as a reminder of what God said to Adam and Eve after they succumbed to sin and ate the forbidden fruit in the Garden of Eden: "for you are dust, and to dust you shall return.” (Genesis 3:19b, ESV) The ash mark symbolizes inner repentance. The Old Testament is littered with examples of people covering themselves with ash - 2 Samuel 13:19, Esther 4:1,3, Isaiah 61:3, Jeremiah 6:26, Ezekiel 27:30, Daniel 9:3, and Job 42:6 - just to name a few! Jesus even alluded to the practice in Matthew 11:21! Many people leave the ashes on their foreheads all day as a witness that all are sinners and in need of Christ's forgiveness. 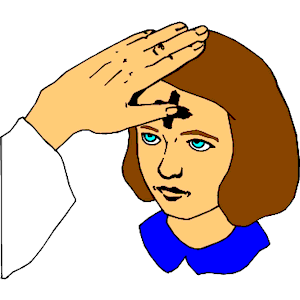 Ash Wednesday, this year on March 1, is the first day of the season of Lent. Although popularized by the Catholic Church, neither Ash Wednesday, nor Lent, are just another "Catholic thing." Lent, and by extension, Ash Wednesday, date back to, at least, the legalization of Christianity in AD 313. Legalization of Christianity helped formalize the practice of Lent. Following the Council of Nicea in AD 325, Lent became even more widely practiced. Lent is the practice of fasting for the 40 days (excluding Sundays) before Resurrection Sunday. What is the first thing you think of when fasting? Food, right? In the Bible, fasting is associated with, but it is not limited to, food. Love to play video games or computer games? You can fast from them. Spend hours on Facebook, Twitter, Instagram, and tumblr? You can fast from them. Love all things sweet? You can fast from them. It is up to you, but remember, it is suppose to be hard! If it is easy, it would not strengthen your relationship with Christ. Lent is to remind us the sacrifice Jesus Christ made, so that we may spend eternity with Him. Through a sacrifice of our own, and our reliance on Him during our struggle, we can deepen and strengthen our relationship with Him.